Sierra Nevada brews are more widely available than most that we drink. Still, nothing has completely struck out with us. Their Celebration Ale this year ranked surprisingly high on our blind winter beer tastings. So when we saw an American style IPA by them in the cooler at World Wines & Liquor in Mentor, we couldn't pass it up. 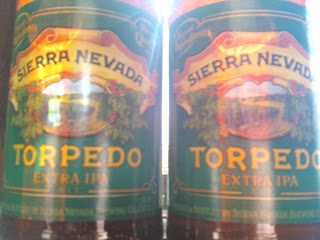 The first thing you notice from their Torpedo IPA is the rich amber color and a deliciously frothy head. Upon first taste of the 7.2% ABV brew you are reminded of the 70 IBUs but it is immediately overtaken by a floral and citrus arrangement. These hops don't quite wallop but at the finish, you are reminded of them as their taste lingers in your mouth. There is nothing quite outstanding in this brew. It's got hops for a hophead, but not enough. Also, it's too hoppy for a beginner. This would be an intermediary brew for those not used to American IPA's. What won us over for this beer is the surprisingly high drinkabilty, much like Great Lake's Oktoberfest. If you want a sipping IPA, this isn't it. If you want to be floored by 4 PM on a Sunday like we will be, pick yourself up a 6-pack or two. If rock is dead it's because the kikes who own all the record companies deliberately killed it. It's all part of their overall agenda to elevate femmexnegroes while marginalizing the WHITE AMERICAN GENTILE MAN (in accordance with The Protocols - http://100777.com/protocols), an agenda that obviously extends all the way to the Whitehouse. It's not only music, you see this agenda hard at work in ads, TV, movies, hiring, college admissions, even our open borders which welcome primarily anti-Christian, non-whites.